There are worse places to spend eternity! what a unique point of view. I love the color. 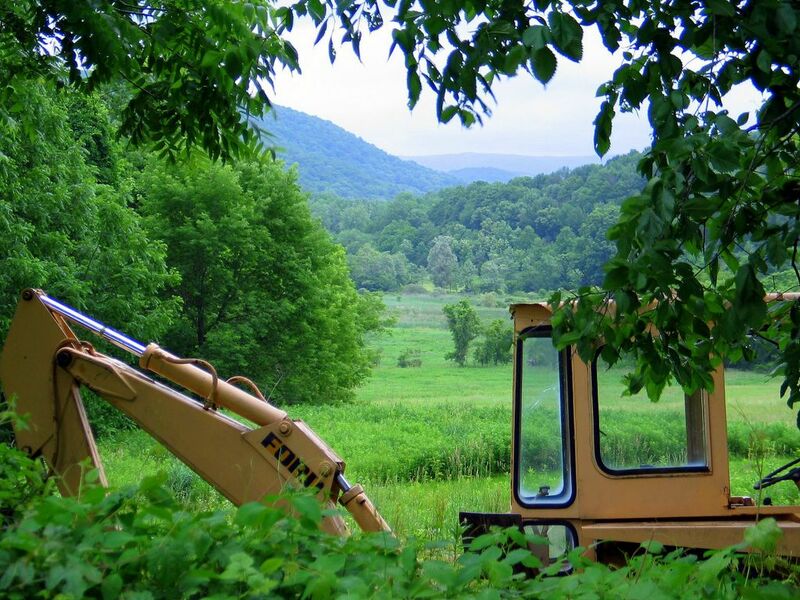 Fortunately, the bright color of the backhoe indicates it hasn't been going it alone for long. The yellow and green show up beautifully. Where did you capture this? Not something you'd always think to take a photo of...but it turned out great! The yellow really brings out the greens of the landscape. Hi, I found your blog today. Is very interesting and the photos are beautiful. This place looks great for meditation and rest. I'll be back. Nice shot Jenny. The exuberant vegetation against the machines of man in paradise lost. All this greenery is refreshing! Thank you! You're right Jenny, far worse places. And as any such thing as 'perfection' is relative, I'd settle for the inconvenience of a mechanical digger (manageable size! ), cos the beautiful, peaceful landscape is much, MUCH larger. Anyway a touch of yellow brings positive chakra (viz. flag of Brazil!) in harmony with the green. Jenny, i love caterpillars shots ! But in that green frame, it's amazing.